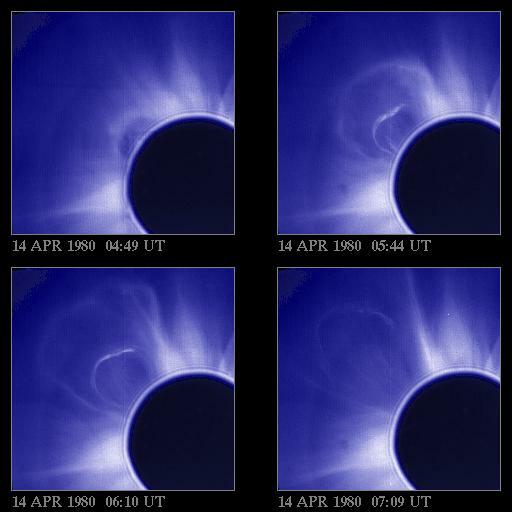 A 4-image time sequence (north sector) taken by SMM on April 14, 1980 shows the outer and inner loops of a coronal mass ejection as it expands outward over the north pole of the sun. Archetypal loop/cavity with structured, interior (prominence) loop/cavity. Inner loop emitting in line of h-alpha at 07:18 and 07:21. Event is superposed on rays. Western leg is superposed on streamer. Loop front flattens as it moves out through field of view. Region is blown out. Deflections.